About the same time as the "Soviet deployment" into Afghanistan, the United States began giving several hundred million dollars a year in aid to the Afghan Mujahideen insurgents fighting the Afghan Marxist government and the Soviet Army in Operation Cyclone. Along with native Afghan mujahideen were Muslim volunteers from other countries, popularly known as "Afghan Arabs". The most famous of the Afghan Arabs was Osama bin Laden, known at the time as a wealthy and pious Saudi who provided his own money and helped raise millions from other wealthy Gulf Arabs. When the war ended, bin Laden organized the al-Qaeda organization to carry on armed jihad in other venues, primarily against the United States—the country that had helped fund the mujahideen against the Soviets. A number of commentators have described Al-Qaeda attacks as "blowback" or an unintended consequence of American aid to the mujahideen. In response, the American government, American and Pakistani intelligence officials involved in the operation, and at least one journalist (Peter Bergen) have denied this theory. They maintain the aid was given out by the Pakistan government, that it went to Afghan not foreign mujahideen, and that there was no contact between the Afghan Arabs (foreign mujahideen) and the CIA or other American officials, let alone arming, training, coaching or indoctrination. The Central Intelligence Agency helped Osama bin Laden build an underground camp at Khost, which bin Laden used to train Mujahideen soldiers. The United States would later attack this camp when bin Laden was held responsible for the United States embassy bombings in Africa. During the anti-Soviet war Bin Laden and his fighters received American and Saudi funding. Some analysts believe Bin Laden himself had security training from the CIA. Robin Cook, Foreign Secretary in the UK from 1997–2001, believed the CIA had provided arms to the Arab mujahideen, including Osama bin Laden, writing, "Bin Laden was, though, a product of a monumental miscalculation by western security agencies. Throughout the '80s he was armed by the CIA and funded by the Saudis to wage war against the Russian occupation of Afghanistan." Bandar bin Sultan: This is ironic. In the mid-'80s, if you remember, we and the United - Saudi Arabia and the United States were supporting the Mujahideen to liberate Afghanistan from the Soviets. He [Osama bin Laden] came to thank me for my efforts to bring the Americans, our friends, to help us against the atheists, he said the communists. Isn't it ironic? U.S. government officials and a number of other parties maintain that the U.S. supported only the indigenous Afghan mujahideen. They deny that the CIA or other American officials had contact with Bin Laden and Al Qaeda, let alone armed, trained, coached or indoctrinated them. Many American scholars and reporters have called the idea of a CIA-backed Al Qaeda "nonsense", "sheer fantasy", and "simply a folk myth." With a quarter of a million local Afghans willing to fight there was no need to recruit foreigners unfamiliar with the local language, customs or lay of the land. With several hundred million dollars a year in funding from non-American, Muslim sources, Arab Afghans themselves would have no need for American funds. Americans could not train mujahideen because Pakistani officials would not allow more than a handful of U.S. agents to operate in Pakistan and none in Afghanistan. The Afghan Arabs were militant Islamists, reflexively hostile to Westerners, and prone to threaten or attack Westerners even though they knew the Westerners were helping the mujahideen. The US government greatly feared arming or training Arabs would lead to attacks on Israel with those arms or training. Al-Qaeda leader Ayman al-Zawahiri says much the same thing in his book Knights Under the Prophet's Banner. Bin Laden himself once said "The collapse of the Soviet Union ... goes to God and the mujahideen in Afghanistan ... the US had no mentionable role," but "collapse made the US more haughty and arrogant." In Ghost Wars (2004), Steve Coll recounted: "Bin Laden moved within Saudi intelligence's compartmented operations, outside of CIA eyesight. CIA archives contain no record of any direct contact between a CIA officer and bin Laden during the 1980s." 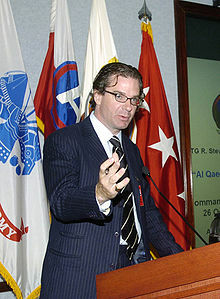 According to CNN journalist Peter Bergen, known for conducting the first television interview with Osama bin Laden in 1997, "Bin Laden had his own money, he was anti-American and he was operating secretly and independently." Marc Sageman, a Foreign Service Officer who was based in Islamabad from 1987–1989, and worked closely with Afghanistan's Mujahideen, states that no American money went to the foreign volunteers. No U.S. official ever came in contact with the foreign volunteers. They simply traveled in different circles and never crossed U.S. radar screens. They had their own sources of money and their own contacts with the Pakistanis, official Saudis, and other Muslim supporters, and they made their own deals with the various Afghan resistance leaders." The CIA was very reluctant to be involved at all. They thought it would end up with them being blamed, like in Guatemala." So the Agency tried to avoid direct involvement in the war, ... the skittish CIA, Cannistraro estimates, had less than ten operatives acting as America's eyes and ears in the region. Milton Bearden, the Agency's chief field operative in the war effort, has insisted that "[T]he CIA had nothing to do with" bin Laden. Cannistraro says that when he coordinated Afghan policy from Washington, he never once heard bin Laden's name. Both flatly denied that any CIA funds ever went to bin Laden. They felt so strongly about this point that they agreed to go on the record, an unusual move by normally reticent intelligence officers. Mr. Peikney added in an e-mail to me: “I don’t even recall UBL [bin Laden] coming across my screen when I was there. According to Milton Bearden the CIA did not recruit Arabs because there were hundreds of thousands of Afghans all too willing to fight. The Arab Afghans were not only superfluous but "disruptive," angering local Afghans with their more-Muslim-than-thou attitude, according to Peter Jouvenal. Veteran Afghan cameraman Peter Jouvenal quotes an Afghan mujahideen as saying "whenever we had a problem with one of them [foreign mujahideen], we just shot them. They thought they were kings." Many who traveled in Afghanistan, including Olivier Roy and Peter Jouvenal, reported of the Arab Afghans' visceral hostility to Westerners in Afghanistan to aid Afghans or report on their plight. BBC reporter John Simpson tells the story of running into Osama bin Laden in 1989, and with neither knowing who the other was, bin Laden attempting to bribe Simpson's Afghan driver $500—a large sum in a poor country—to kill the infidel Simpson. When the driver declined, Bin Laden retired to his "camp bed" and wept "in frustration." Sir Martin Ewans, noted that the Afghan Arabs "benefited indirectly from the CIA's funding, through the ISI and resistance organizations," and that "it has been reckoned that as many as 35,000 'Arab-Afghans' may have received military training in Pakistan at an estimated cost of $800 million in the years up to and including 1988." Some of the CIA's greatest Afghan beneficiaries were Arabist commanders such as Jalaluddin Haqqani and Gulbuddin Hekmatyar who were key allies of Bin Laden over many years. Haqqani—one of Bin Laden's closest associates in the 1980s—received direct cash payments from CIA agents, without the mediation of the ISI (Charlie Wilson described Haqqani as "goodness personified"). This independent source of funding gave Haqqani disproportionate influence over the mujahideen, and helped Bin Laden develop his base. Sheik Omar Abdel Rahman, an associate of Bin Laden's, was given his visas to enter the US on four separate occasions by the CIA. Rahman was recruiting Arabs to fight in the Soviet-Afghan war, and Egyptian officials testified that the CIA actively assisted him. Rahman was a co-plotter of the 1993 World Trade Center bombing. ^ Farley R (2013). "Rand Paul's Bin Laden Claim Is 'Urban Myth'". FactCheck.org. Retrieved 6 Mar 2019. ^ Bergen P (2011). "Five myths about Osama bin Laden". The Washington Post. Retrieved 6 Mar 2019. ^ Burke J (2011). "The 10 key myths about Osama bin Laden". The Guardian. Retrieved 6 Mar 2019. ^ Harding L (2000). "Bin Laden: the question facing the next US president". The Guardian. Retrieved 22 Apr 2017. ^ "Al-Qaeda's origins and links". BBC News. 2004. ^ Cook R (2005). "The struggle against terrorism cannot be won by military means". The Guardian. London: Guardian Unlimited. Retrieved 8 Jul 2005. ^ Bhutto B (20 Mar 2003). Dinner with Portillo. BBC Four. ^ King L (1 Oct 2001). "America's New War: Responding to Terrorism". Larry King Live. CNN. CNN Transcripts. ^ "Bin Laden comes home to roost". BBC News. ^ a b Roy O (2004). Globalized Islam: The Search for a New Ummah. New York: Columbia University Press. pp. 291–92. ISBN 9780231134996. ^ a b c Sageman M (2004). Understanding Terror Networks. Philadelphia: University of Pennsylvania Press. pp. 57–8. ISBN 9780812238082. ^ a b "Bergen: Bin Laden, CIA links hogwash". CNN. 2006. Retrieved 9 Jan 2007. ^ Bergen P (2001). "Blowback: The CIA and the Afghan War". Holy War Inc. New York: The Free Press. p. 65. ISBN 9780743234672. As said by Peter Jouvenal. ^ "Did the U.S. "Create" Osama bin Laden?". U.S. Department of State. 14 Jan 2005. Archived from the original on 10 Mar 2005. Retrieved 9 Jan 2007. ^ Coll S (2004). Ghost Wars: The Secret History of the CIA, Afghanistan, and Bin Laden, from the Soviet Invasion to September 10, 2001. Penguin Group. p. 87. ISBN 9781594200076. ^ a b c d Bergen P (2001). "Blowback: The CIA and the Afghan War". Holy War Inc. New York: The Free Press. pp. 65–7. ISBN 9780743234672. ^ Beinart P (2001). "Back To Front". The New Republic. ^ Miniter R (2003). "Dispelling the CIA-Bin Laden Myth". International. Fox News. Retrieved 6 Oct 2009. ^ a b c d Wright L (2006). Looming Tower: Al Qaeda and the Road to 9/11. New York: Knopf. ISBN 9780307266088. ^ Simpson J (2000). A Mad World, My Masters: Tales from a Traveller's Life. London: Macmillan. p. 83. ISBN 9781743034538. ^ Ewans, Martin (2004). Conflict in Afghanistan: Studies in Asymetric Warfare. London: Routledge. p. 128. ISBN 9781134294817. ^ Ewans M (2013). Afghanistan - A New History. London: Routledge. p. 205. ISBN 9781136803390. ^ Gopal A, Mahsud MK, Fishman B (2013). "The Taliban in North Waziristan". In Bergen P, Tiedemann K (eds.). Talibanistan: Negotiating the Borders Between Terror, Politics, and Religion. USA: Oxford University Press. pp. 132–142. ISBN 9780199893096. ^ Elias-Sanborn B, ed. (11 Sep 2012). "The Haqqani History: Bin Ladin's Advocate Inside the Taliban". National Security Archive. Retrieved 6 Mar 2019. ^ Brown V, Rassler D (2013). Fountainhead of Jihad: The Haqqani Nexus, 1973-2012. USA: Oxford University Press. pp. 68–69. ISBN 9780199327980. ^ Kepel, Gilles (2002). Jihad: The Trail of Political Islam. Harvard University Press. pp. 300–304. ISBN 9781845112578. ^ Jehl D (1993). "C.I.A. Officers Played Role In Sheik Visas". The New York Times. Retrieved 6 Mar 2019. ^ Marshall A (1998). "Terror 'blowback' burns CIA". The Independent. Retrieved 16 Sep 2009.